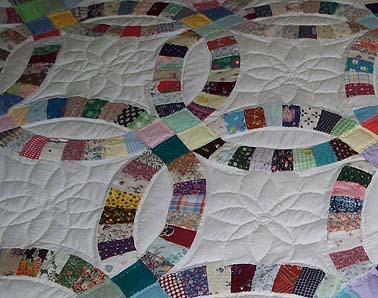 The Double Wedding Ring quilt begun in 1979 and was made for my husband, Bob. When he first saw the pattern, he started dropping hints. At that time, I was hand quilting on a rickety, cheap frame so I told him I would make the top but he would have to make a terrific frame for me to use to quilt it. As life often got in the way, I hand pieced this quilt in stops and starts. I cut the templates in sandpaper and each piece of fabric was individually scissor cut. It was definitely a work of love…. much appreciation to him for caring for me through my devastating illness and taking near total care of our newborn son. This quilt was my way of saying “thank you”. I took the pattern and hand sewing project to my grandmother’s house. She loved the pattern and immediately copied it. She saw I was making it scrappy and offered to let me dig in her scrap bag for more variety. I also showed the pattern to my mother, who loved and copied it too. She also let me dig in her scrap bag. That was the beginning of our scrap bag swaps. Anytime my grandmother, mother and I would get together, we brought along our scrap bags. Each of us were garment sewers so new scraps were always introduced. We loved talking quilts as we snatched bits of fabric from each other. It was such fun! Within a very short time, Mammie hand pieced and hand quilted 3 DWR quilts and loved to tease me about being slow. Mother had almost finished her top when she passed. Mammie finished it for her. It took me 15 years to piece and another 12 before Bob made the quilt frame. Sadly, Mammie passed before mine was complete. I often feel her standing at my shoulder as I quilt so I am certain she has seen it. As promised, Bob FINALLY built the quilt frame of my dreams. When it was complete, I immediately loaded it with this quilt and designed the original quilting pattern. It’s daisies and darts which represents Bob’s and my long life together. We are daisy poor and both of us have sharp tempers. The center of the daisy is marked by a double circle made using our wedding rings as the template. 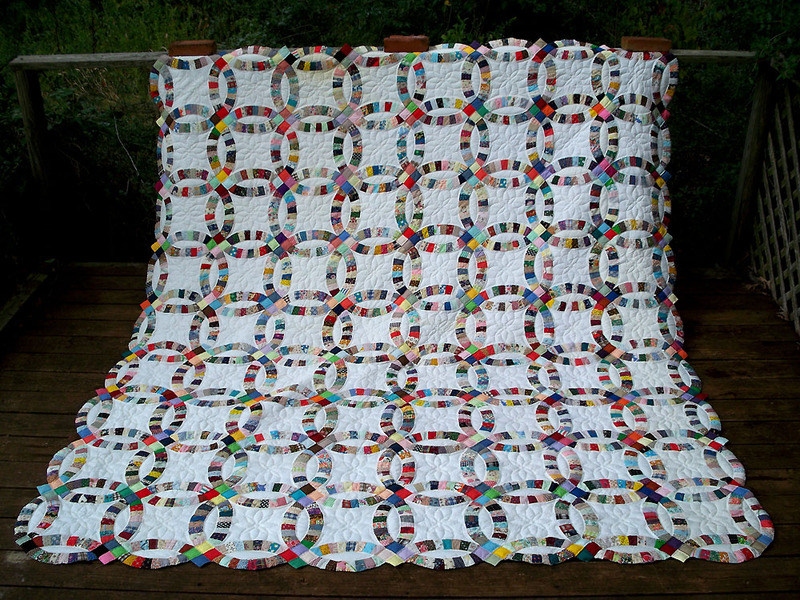 The quilt is backed with wide white fabric. The quilt is entirely hand stitched and hand quilted. It has a knife-edge finish in scallops and points. This quilt is a treasure! I hope you have a label on it. I have 3 quilts that are still lacking one, but I plan on making it happen soon. Thanks Becky! The label for this quilt is actually quilted into a corner block. If I don’t quilt details into a block or border, I force myself to embroider a label and attach before binding. Labeling is not my favorite activity.